Steven (Chicagoland, United States) on 9 April 2019 in Plant & Nature and Portfolio. How ironic that a woman would be walking into the frame with the same colored top. Absolutely superb! I have never seen this flowers in the water. This park is even pretty at the ground. Very cleverly 'planted' . .
Magnifiques couleurs, un régal pour les yeux. Excellent image of both the plants and the woman appearing in the shot. Oh, she wears the same color ! Ha! The walking bromeliad stole the show then. The colors are striking. Beautiful image. Wow "And that too with great "Fanfare" pun intended..Those leaves are like fans !! No doubt, it was a happy coincidence. Superb capture and lovely graphic composition. Exquisite ! Nicely framed and a fine exposure. Merveilleux... un vrai bonheur des yeux. 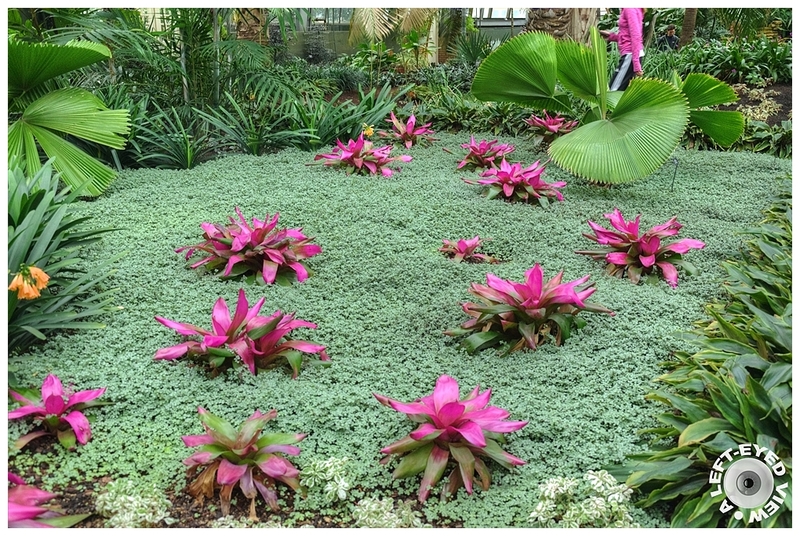 Beautiful garden, these bromeliads are fabulous !!! Absolutely beautiful! The colors are just incredible. I have never seen them floating before. An incredible image. @Elaine Hancock: They actually aren't floating. To me they just appeared to be surrounded by the "waves" of green foliage. Oh isn't that fantastic!! I do miss having my little pond... I spent so much time throughout the year caring for the fish and the plants! Un plan d'eau original et superbe!